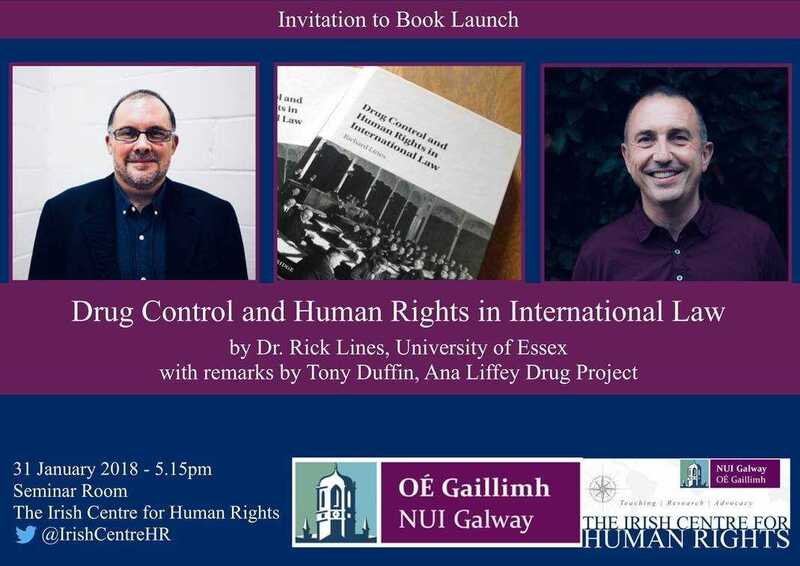 Tony Duffin, CEO of Ana Liffey Drug Project is guest speaker at the Irish launch of “Drug Control and Human Rights in International Law” by Dr Rick Lines at the Irish Centre for Human Rights, NUI Galway. Venue: Seminar Room, Irish Centre for Human Rights, NUI Galway. Human rights violations occurring as a consequence of drug control and enforcement are a growing concern, and raise questions of treaty interpretation and of the appropriate balancing of concomitant obligations within the drug control and human rights treaty regimes. Tracing the evolution of international drug control law since 1909, this book explores the tensions between the regime's self-described humanitarian aspirations and its suppression of a common human behaviour as a form of 'evil'. Drawing on domestic, regional and international examples and case law, it posits the development of a dynamic, human rights-based interpretative approach to resolve tensions and conflicts between the regimes in a manner that safeguards human rights. Highlighting an important and emerging area of human rights inquiry from an international legal perspective, this book is a key resource for those working and studying in this field.